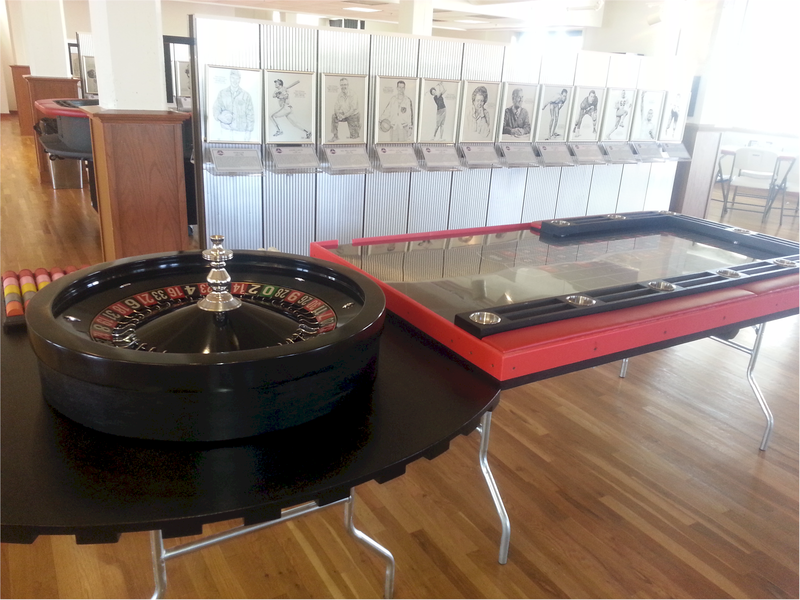 Want to rent the Coolest Roulette Table? Coming right up! 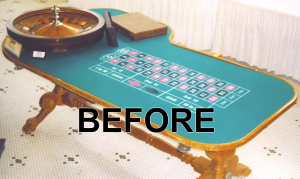 The image left shows our 8′ roulette in it’s “glory days”. Built in the 1920’s, this table had been around the block! 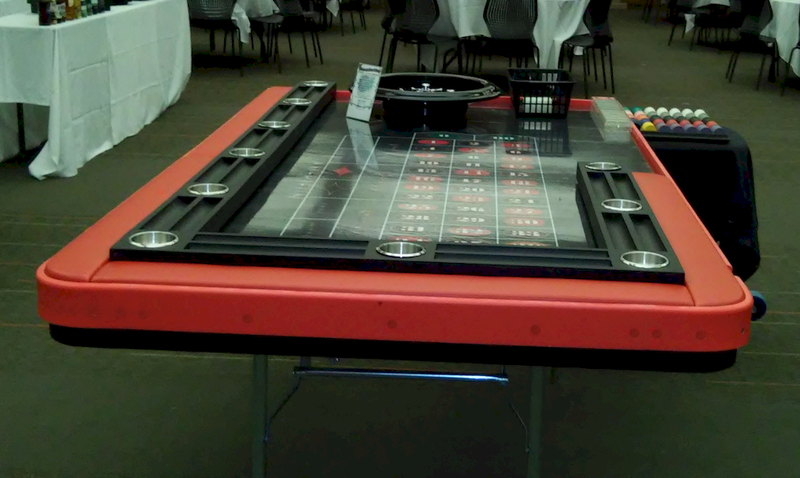 Interestingly though, imagine all the games that this table hosted, those smoke-filled casino halls of yesterday, there’s no telling who all played on it. 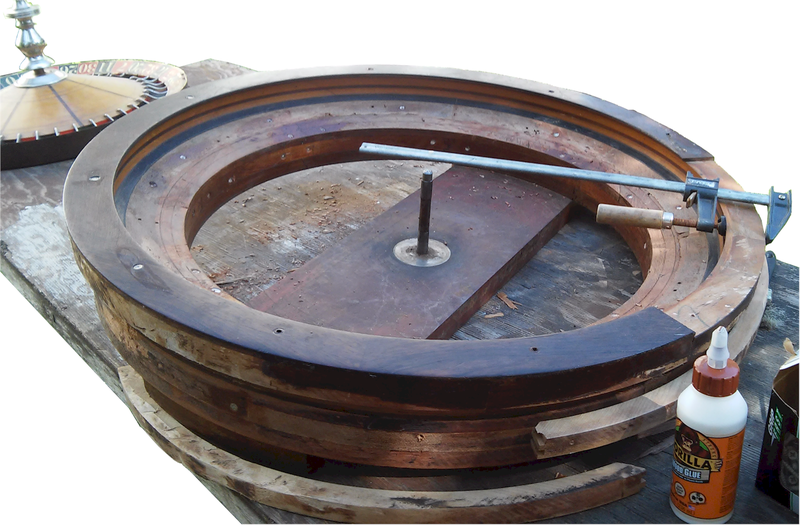 But don’t fret, this table will live on in a sense – we are restoring the wheel and the table definitely has re-purposing potential. 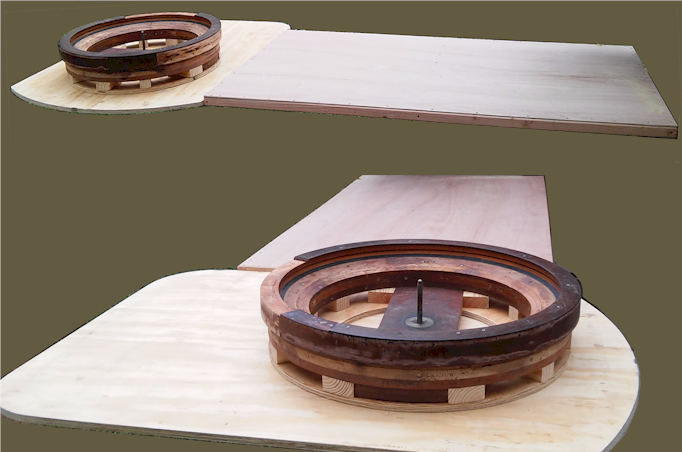 For us, this table had two main issues: the wheel needed restored and the table was very heavy; not well-suited for a mobile production. In addition, the roulette wheel was incorporated into part of the 8′ playing surface, which was another disadvantage size-wise for the player. 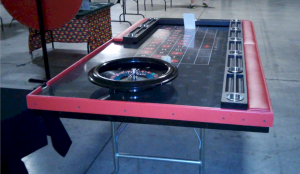 We will be re-fabricating the playing surface and adding an additional separate table for the wheel that “meets up” with the playing area. This will be an over-sized and exciting table. 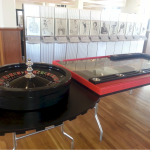 Our over-sized Roulette Table(s) will be available in THREE SIZES. 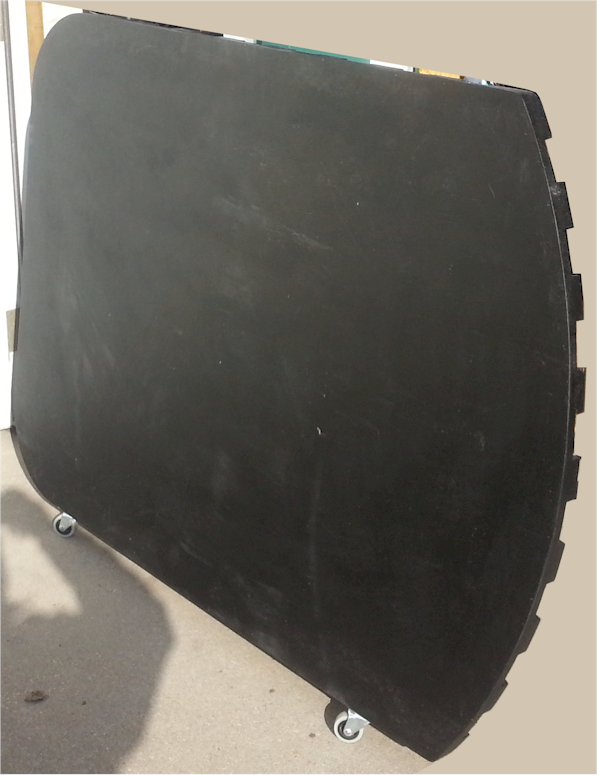 78″X42″ overall (w/ 18″ Wheel). 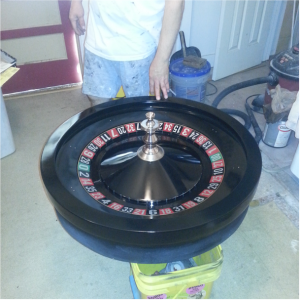 120″X42″ overall w/ Full-size 32″ Casino Roulette Wheel. 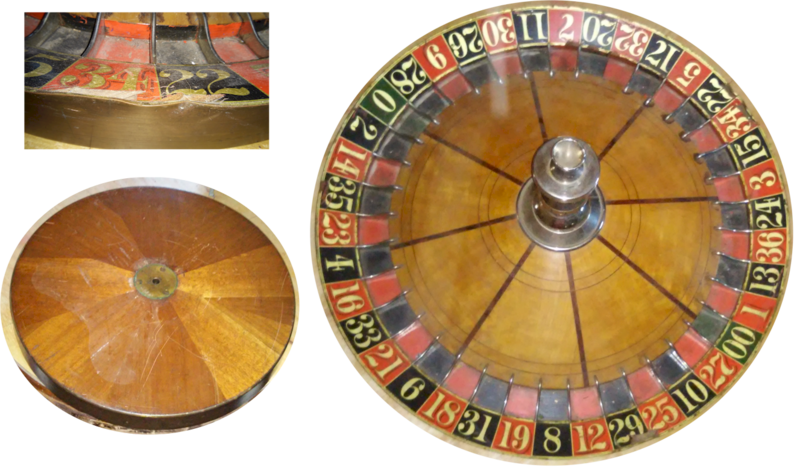 A whopping 198″ DOUBLE ROULETTE! This table will also offer high-tech and luxury features will make this table not only the biggest, but the best – we guarantee. 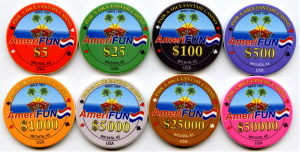 We are all about creativity and bringing you BETTER THAN VEGAS is our main focus. 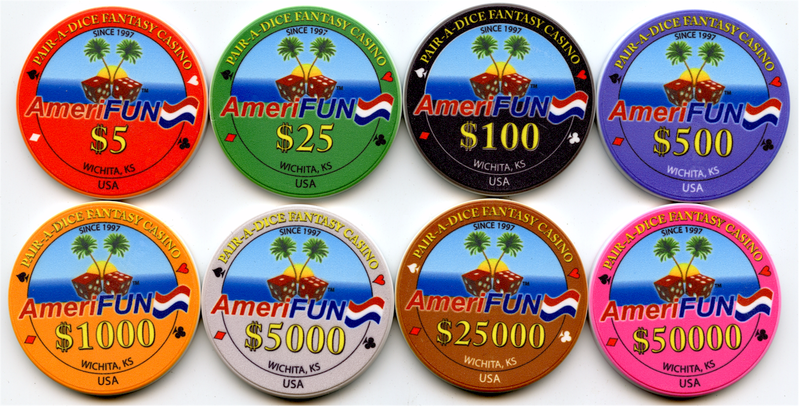 Limited Dealer Chip Sort/Work Area. 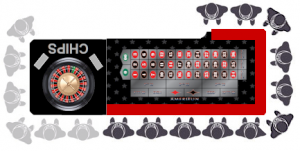 Required altering custom layout standard design (we may still do this in the future). Here is the plan! Photos of the real thing coming very soon. Chick for larger view and have a closer look. The beauty of this design is in the arrangement. 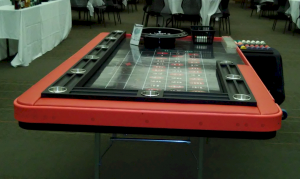 We had to have a ‘wheel table’ that was usable with both large tables and one issue was that a square table, while functional, looked terrible with the 10′ version (typically these have rounded corners). 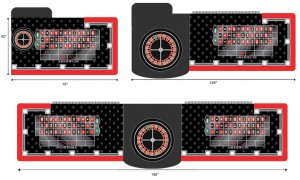 The solution was a player-side oval shape that actually brought the wheel forward and closer to the players (unlike a casino which will set it back for additional security). And remember, as mentioned, very special features will be available with this table. Some of the features include on-board lighting, chip rail, cup holders and arm rest. 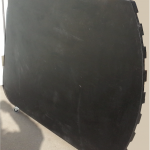 78″X42″ overall w/ 18″ Wheel. 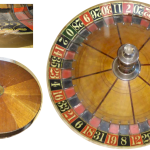 198″ (17′) DOUBLE ROULETTE, Serves 30. Available in 2019 or by advance request. 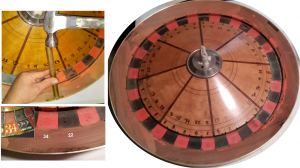 We were unsure of the manufacturer of this wheel since there where no markings on it whatsoever. We were told by the seller that it was from the 1920’s but that’s about the extent of it. This wheel had definitely seen better days! 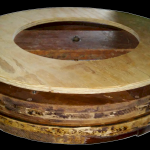 The veneer was separating from it’s mahogany core both inside and out, the rim was missing a large chuck of rosewood, it had been dropped more than once and suffered cosmetically from 100 years of wear and tear. Luckily, it spun perfectly however. Unlike modern wheel bowls with one solid piece of wood, this bowl was made up of numerous curved pieces dove-tailed together. There was a larger diameter upper section and a smaller lower section built to fit inside a hole in the table. The upper section was fine but the lower sections were was out-of-whack pretty good and the veneer was buckled and busted. We really hated to remove the veneer, not all of it was bad, but it had to be done to true-up and stabilize the multi-piece core (plus it would of never have looked quite right). 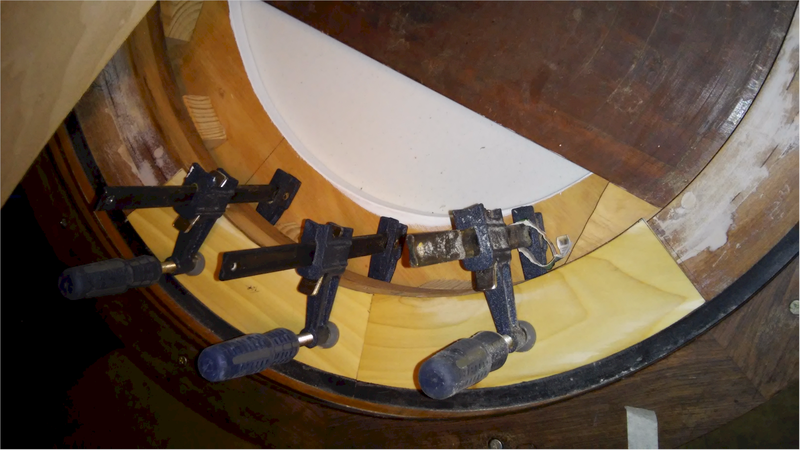 We will re-veneer the apron (inside horizontal surface) as well as around the outside skirts of the bowl which will also provide additional stability. The antique value of this piece was lost so we’re now calling it a refurbishment instead of a restoration (but wait til you see the finished product!). Since this is a refurbishment we decided alter the bottom and expand the height. In order to be a stand-alone unit, it needed a new base (occasionally clients will want to rent just the wheel). We slightly kept with the 2-tier design however in order to retain the ability to place it inside a cutout later if need be. 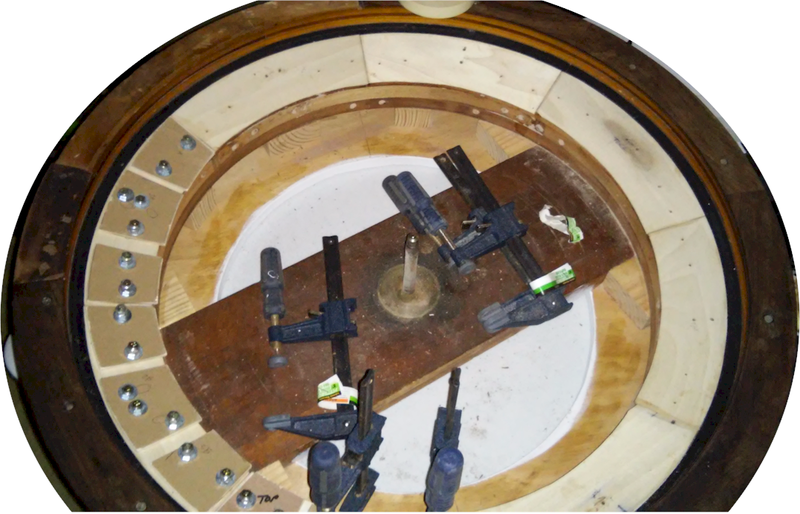 The new base and lower section will be covered with 1/4″ plywood, adding further stability, and will be refinished along with the upper section (the upper side will be covered with new veneer). 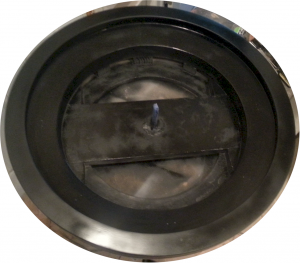 The hollow void in the bottom provides for something a little extra that we’ll add later, you’re gonna love it! About ready for veneer. We still need to fill in all holes for a totally smooth surface for max adhesion. We are also adding another feature to the bowl (and not the addition from above, something else!). 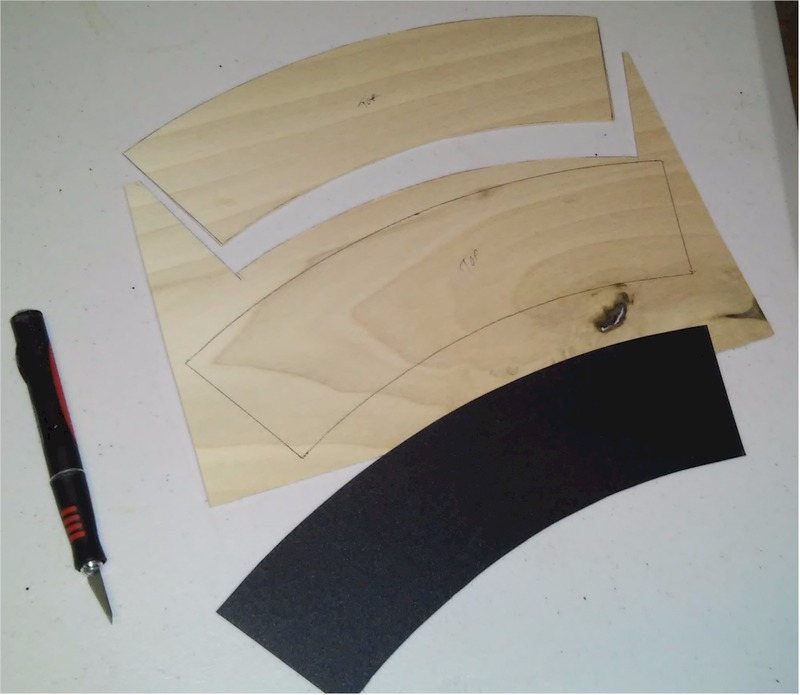 The veneer actually went easier than planned. We used a piece of scrap as a pattern to trace the shape and cut them with a hobby knife. 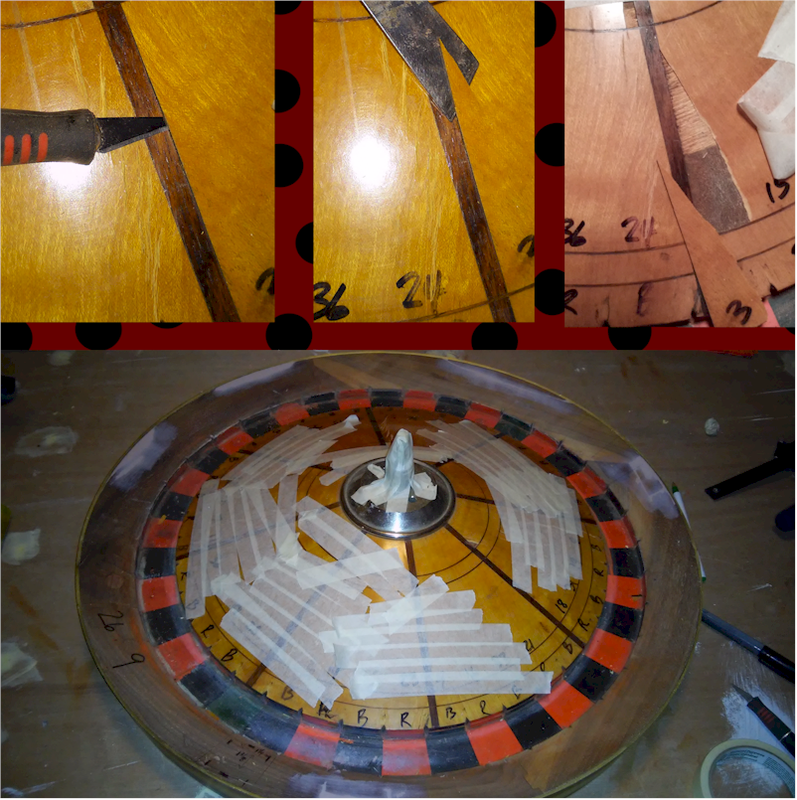 The veneer had to be applied in sections, as original, b/c there is a conical shape to the inside of the bowl. 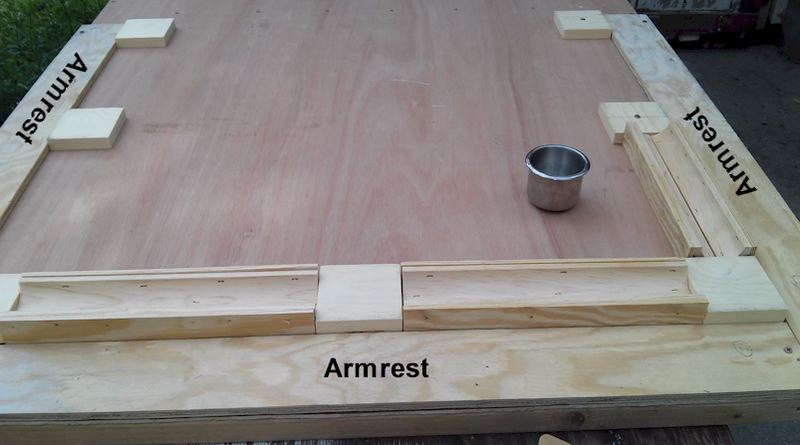 In addition, using clamps was difficult b/c of the slant. 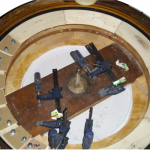 The solution was shims screwed through the ball diverter holes along with some temporary holes that will be filled in later. This approach gave us a long-lasting TIGHT bond (esp since we always use LOTS of glue). Getting close! 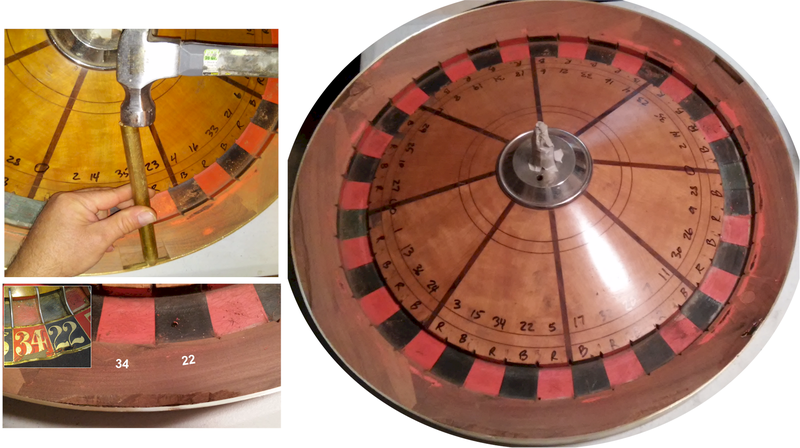 Notice the repaired bowl rim and completed veneer!! Ready for one more piece of veneer on the side and it’s ready for primer. First coat of primer, hope you’re as excited as we are! First base coat (more putty, sanding and clear coat to follow – pin stripping too!). 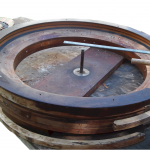 The wheel head cone insert was also made up of a multi-piece core with veneer and was actually fairly solid, it had however also been dropped. 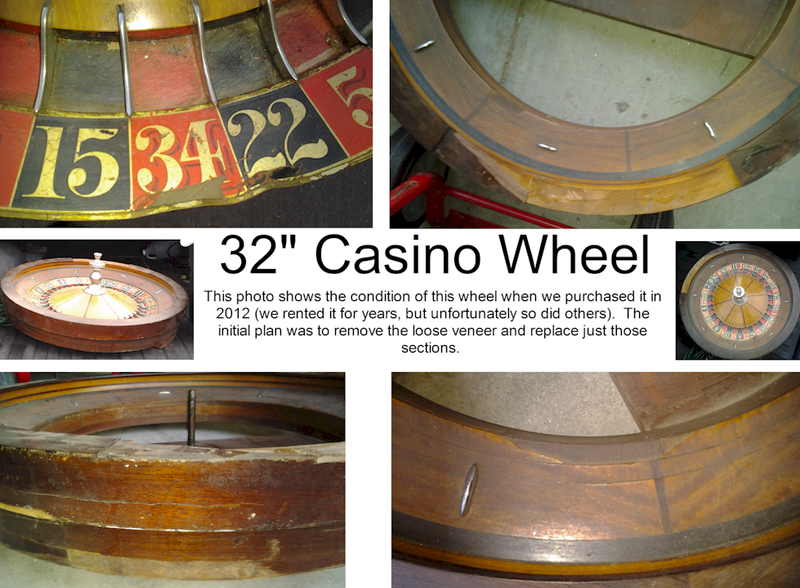 Aside from being a little dirty, the main damage was to the brass ring that was fused to the outside of the assembly. The worst damage was to #’s 34 & 22 with slight damage to 00,1,29,25&35. The damaged wood under the numbers will also be removed, the brass re-worked, the wood replaced, the number backgrounds and ball pockets re-painted, a complete set of new number decals applied and the veneer will re-finished to a high gloss. Also a couple of the dividers are missing and need to be re-fabricated and polished but we’ve done this before. Also wouldn’t mind having the turret re-chromed but we’ll see how it looks after a good polishing! We removed the damaged wood, we were able to chisel out the damage at the cracks to re-attach with glue later. 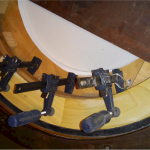 On some numbers we had to remove some additional wood in order to have access to the inside edge of the brass ring. The damage to the brass ring straightened fairly easy. Pls excuse the poor video quality! This video is meant to show how smooth it spins at low speed – This Wheel Spins Beautifully. That was one thing we liked about it, it looked like heck but spun perfect! FILLER & PRIMER. Please Note, if you are viewing this page for advice, here is our 2 cents: Polyester Filler (Bondo®) will not stick to primer (Kilz®), and we have been told that it will not stick to shellac primer sealer either (but we have not tried that yet). 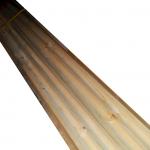 Bondo sticks GREAT to bare wood (as well as bare metal). If you need to coat or “fill in” a void before bondo, use polyester “fiberglass resin” (no wax) or polyester glazing puddy. 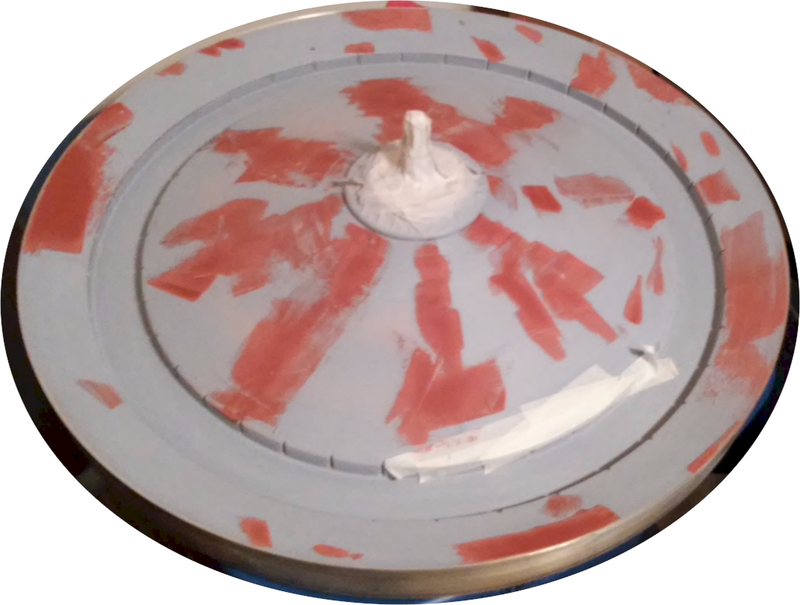 Most primers will stick to bondo but bondo does not stick to much of anything (esp plastic) except bare wood/metal. 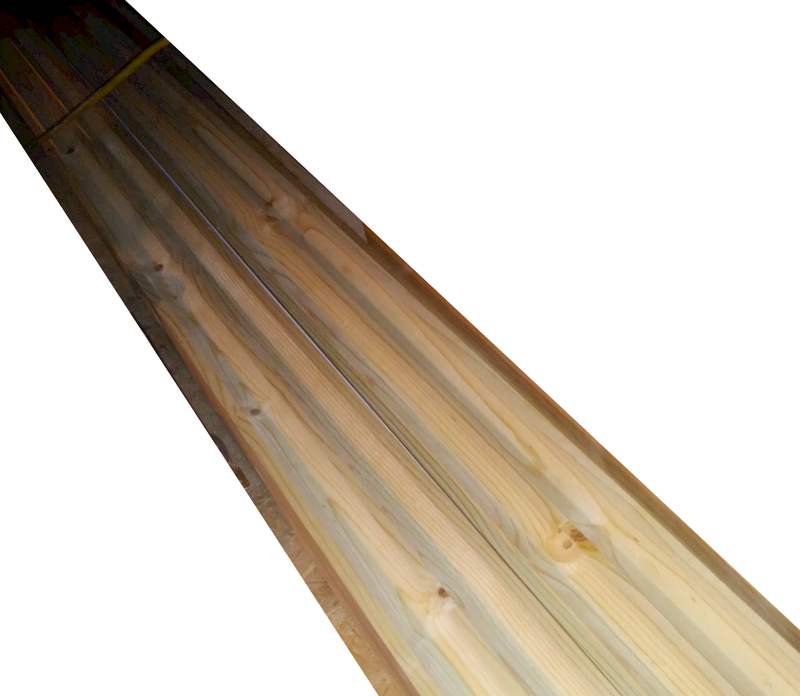 In contrast, regular water-based wood filler sticks to just about anything but it less durable than bondo. 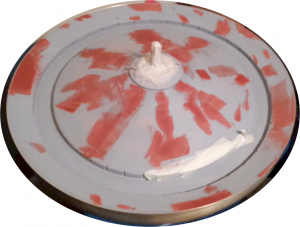 The instructions on the Bondo can says remove paint etc to bare metal/wood, although some guys say it sticks to epoxy primer but we have not tried that yet. 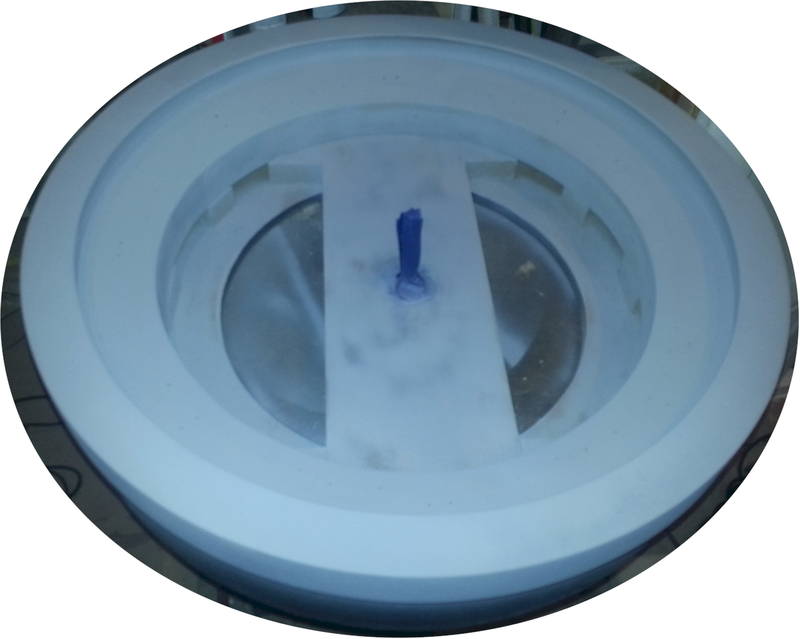 Some also say that less hardener (less heat) yields better adhesion too but we found that to be a fine line between not curing and cures to fast! I have read that one drop of hardener can cure a whole can, yeah but it would surely take a hundred years! One issue with this unit from start to finish has been the veneer. We had to strip most of it from the bowl but the wheelhead’s veneer was slightly better just a little loose here and there. 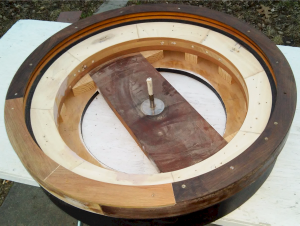 We lifted loose pieces, allowed them to “break” and then re-glued the broken pieces (should have just stripped the whole thing and re-veneered but the convex curves were fairly extreme so we elected to repair the veneer on the wheelhead. We elected to use automotive primer and polyester glazing putty (esp since we used bondo as the initial filler). This photo shows the wheelhead close being ready for basecoat! 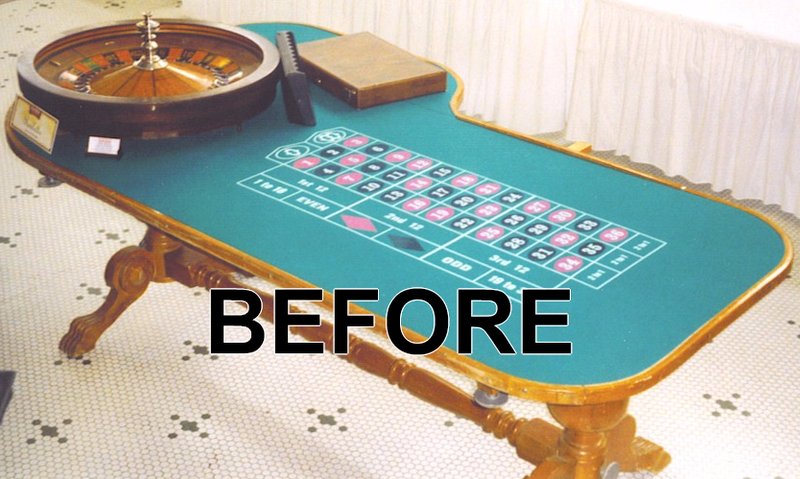 First thing, just to reiterate, the original table “looked” okay but it had to go. 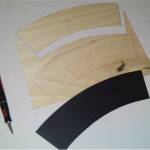 We are a mobile entertainment company, and the double 3/4″ plywood construction was DEFINITELY not conducive to mobile – that’s for sure (you ever lift a piece of 3/4 inch plywood? Now imagine two pieces!). And instead of just building another table (historically we have used single 3/4″ plywood core) we will be fabricating the table with a “lightweight” focus… more to come. This photo shows design implementation of the SINGLE chip rail but this was quickly abandoned for a DOUBLE chip rail. After all, this table needs to be the Best in the World! Also, as mentioned, high-tech features to come!! 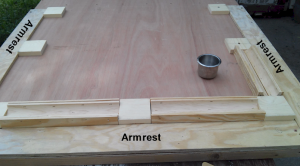 Double Chip Rails ready to be chopped and divided (between cup holders like the above photo). Like this! You can see why we opted for a double chip rail!! Getting close! 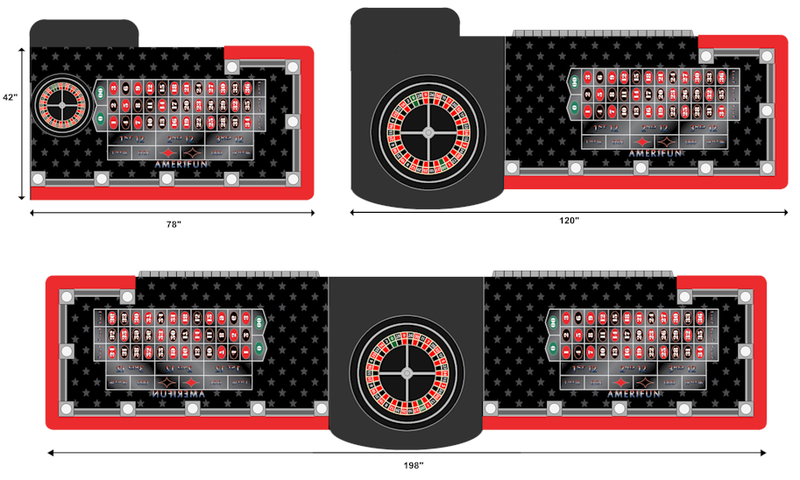 Image shows mostly complete 8′ version that allows for 18″ wheel (shown without additional table for the 32″ wheel; in this version the space for the 18″ wheel will be used for an additional sorting space). Phase 1 completed! 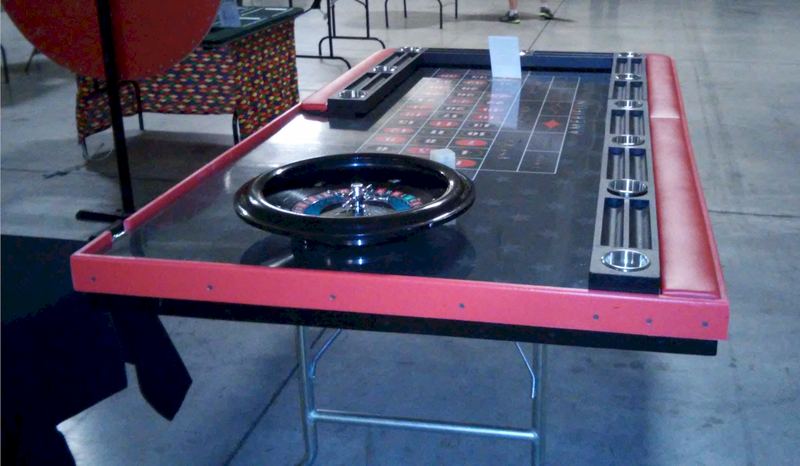 This table allows for use with 18″ wheel. 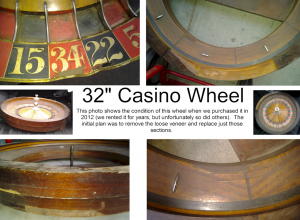 Wheel Support Table (shown in the rough photos above).. notice the “dental work”. Hope you liked this page! Want to see another project? We duplicated our CASHIER CAGE PROP for a client.. see the progress from start to finish here.